Olympic Silver medallist Glory Alozie joins MoC Track Club as Sprint Hurdles Coach! 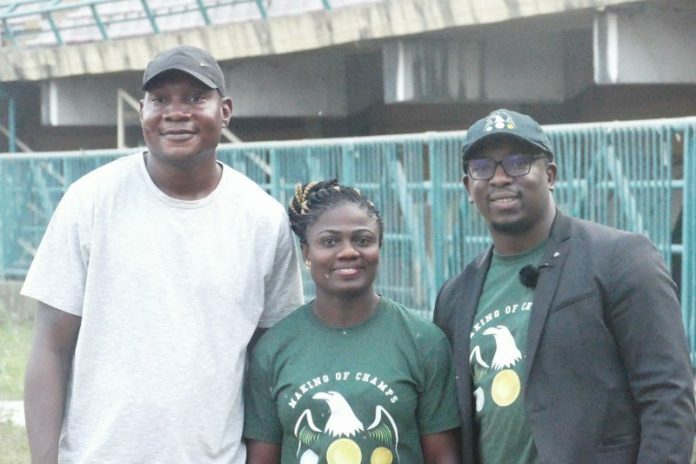 Sydney 2000 Olympic Silver medallist Glory Alozie flanked by MoC Head Coach Deji Aliu, and MoC Founder/CEO Bambo Akani during the unveiling ceremony in Lagos on Thursday. Making of Champions (MoC) Track Club has secured the services of its third Olympic medallist coach in the person of Glory Alozie, who will team up with fellow Olympians Deji Aliu and Uchenna Emedolu, who currently coach at the Lagos and Port Harcourt arms of the club respectively. This was announced at an unveiling ceremony held at the Teslim Balogun Stadium in Lagos on Thursday, January 18th, 2018. Alozie is Nigeria’s first and only Olympic and World Championships medallist (male and female) in the hurdles, and will serve as the MoC’s Sprint Hurdles coach at the Lagos Track Club over an initial period of three months. 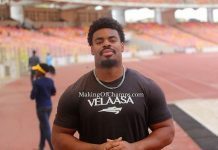 The Sydney 2000 Silver medallist who is passionate about raising future world beaters for Nigeria, teamed up with MoC in 2015 in their quest to raise future champions for the country in Track and Field. She was one of the coaches on ground at the Top Sprinter auditions in Ibadan, Enugu, Benin and the Lagos Finals, and also starred alongside Aliu, Emedolu and Francis Obikwelu as one of the Olympic medalist judges on MoC’s Reality TV show, Top Sprinter Genesis. Alozie enjoyed a spectacular career during her active days and won several medals for Nigeria including Silver at the 1996 World Juniors, two Gold medals at the 1996 and 1998 editions of the African Championships, and Silver medals at both the World Indoor (60m Hurdles) and World (outdoor) Championships in 1999. Her Personal Best of 12.44s in the 100m Hurdles set in 1998, remains the Nigerian, African and Commonwealth Record in the event. Her best time of 10.90s in the 100m was the Nigerian and African record until it was erased by Blessing Okagbare in 2013. She is also Nigeria’s last individual Olympic medalist on the track. “I have always been a part of MoC, but being an official member is something that gives me joy and I feel so honoured. I’ve always said I love what Bambo is doing; it is something that gives hope to Nigerian athletes because now they know they have a system that is working, a good coach like Deji Aliu, and everything else is in place. MoC Founder/CEO Bambo Akani believes that MoC athletes have a lot to gain from Alozie’s wealth of experience, which will also go a long way in improving their professional careers. He said: “I think it is a momentous occasion in Nigeria; we have to bear in mind that this is the last individual Olympic medalist on the track for Nigeria, as far back as Sydney 2000, so it is really exciting to have her in Nigeria, even if it’s only for three months, to introduce our kids to the hurdles and to show them a piece of what it took to get to the top of the world. After winning several laurels for Nigeria, Alozie switched nationalities to Spain in 2001 and has lived there ever since. Pls how do I join the moc? I am a student of uniport. Thanks for your message and apologies for the delay in response. We appreciate your interest in becoming a member of MoC’s track club. We plan to run some trials in the latter stages of 2019 but as this is yet to be confirmed, please fill out the form below with your details, so you can be placed on our waiting list and so we can contact you as required. In the meantime, you can keep up to date with further news related to MoC by regularly tuning in to our website. Have a great day today. very good person.l was in her house 2007 at Valencia and I am very sorry I lost her contact because I was pregnant then and she showed me love and cared for me. I love Gloria so much,she is humble and kind.She hosted for some days in her house in Valencia when I was pregnant for my last born. I lost her contact when l lost my phone, I pray I will meet her again in life because she is so caring.God bless Gloria Oluchi Alozie for me.